Honey Glazed Carrots with Ginger is a deliciously sweet and savory side dish loved by the whole family. Enjoy these Honey Glazed Carrots with your favorite chicken, beef, and fish recipes, or add them to your next holiday menu. Fast, easy, and incredibly addictive, you’ll love the sweet and simple flavors of these delicious glazed carrots with ginger. 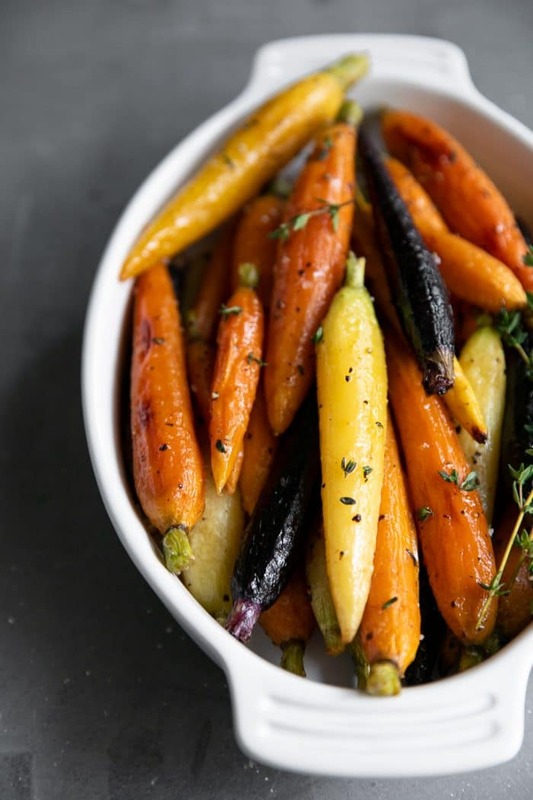 Crazy delicious and super simple to prepare, everyone will love these Honey Glazed Carrots with ginger and fresh herbs. 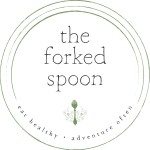 One of the reasons why I love this recipe so much is because it is so simple yet so full of flavor. 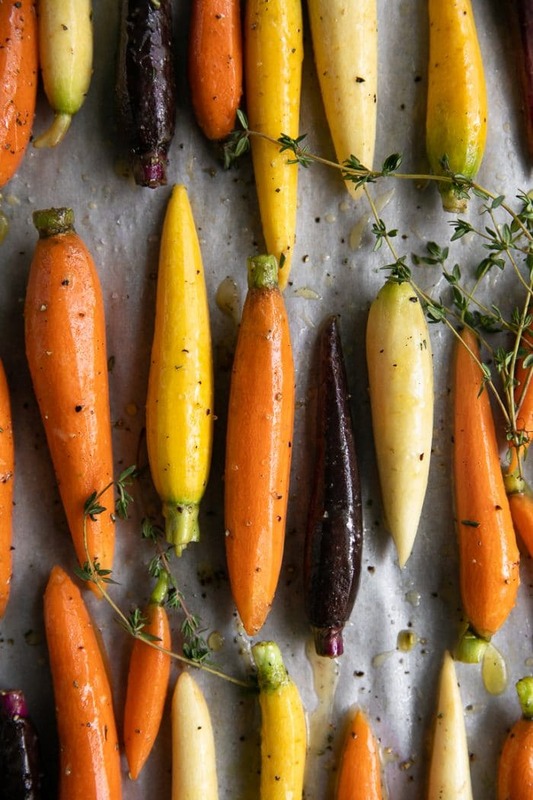 Just a handful of pantry essentials, carrots, and fresh herbs is all it takes to turn carrots from a crunchy lunchbox snack to a sweet and savory favorite dinner side. 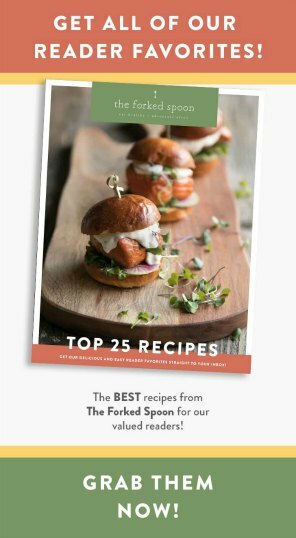 What carrots should I buy to make Honey Glazed Carrots? The carrots you see here are petit rainbow carrots from Trader Joes. These guys are my favorite because I literally have to do no work to get them ready to go. 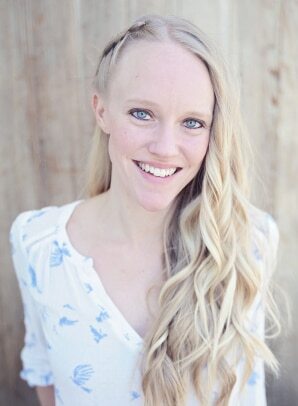 Plus, I love that they are different colors. If you can’t find carrots that a pre-peeled like these, baby carrots or whole carrots that have been washed, dried, and peeled, will work just as great. If your carrots happen to be big and fat, or completely different shapes and sizes I recommend slicing them in half so that they are approximately the same size. After all, same size carrots mean equal cooking time and equal doneness. Honey glazed roasted carrots with ginger are probably one of the easiest (and most delicious!) side dishes you can prepare. I often prepare a double batch since they go so quickly. Preheat the oven. Preheat oven to 400 degrees F and line a large baking sheet with parchment paper. Set aside. Prepare the carrots. 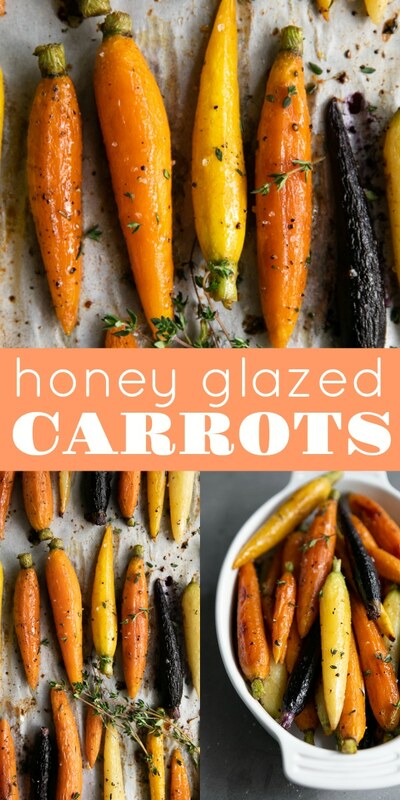 I purchased prepared petit carrots from Trader Joe’s for this honey glazed carrots recipe. However, you can easily prepare this recipe with any carrots. Simply wash and peel your carrots and dry well. If your carrots are thick, I suggest slicing your carrots in half vertically so that they are all approximately equal width. Transfer the prepared carrots to a large mixing bowl. Prepare the glaze. In a small bowl whisk together the olive oil, honey, ginger, salt, pepper, and rosemary. Coat the carrots in the glaze. Add the glaze to the mixing bowl with the carrots. 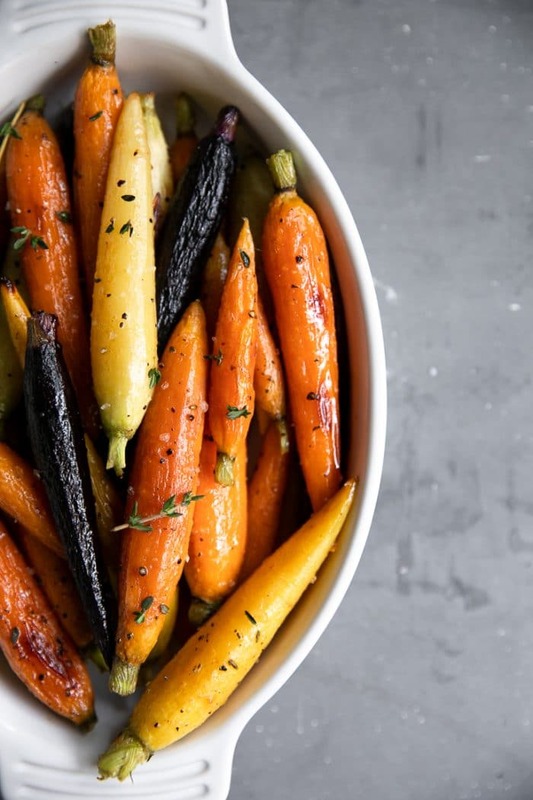 Mix well to completely coat the carrots with the ginger honey glaze. Spread the carrots evenly across the prepared baking sheet. Sprinkle with fresh thyme, if desired. Bake and serve. 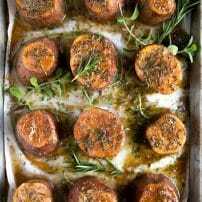 Bake the carrots for approximately 20-25 minutes, or until fully cooked and fork tender. Remove from the oven and drizzle with additional honey, if desired. Enjoy! There are several alternatives to honey that will make this recipe vegan. Maple syrup. my first choice if I were to choose an alternative, maple syrup will add an extra layer of flavor and is guaranteed to be delicious. Sorghum syrup. I have never personally tried sorghum syrup, but from what I understand it’s a huge favorite in the south and has a similar, although less bitter, taste to that of molasses. Brown sugar. pantry essential that’s always there when you need it. They’re roasted. When you roast carrots you are caramelizing the natural sugars organic to the carrots. Caramelized sugar is delicious already, but caramelized sugar with hints of honey, ginger, and fresh herbs is basically the best. No one flavor overpowers the other. In other words, these carrots aren’t too gingery, aren’t too sweet, and don’t taste like I’m eating an herb bush. They’re perfectly balanced. Carrots are super healthy. 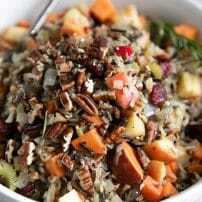 Great for the eyes, great for the immune system, there is nothing negative to say about the humble carrot. Kids love them too! And so do dogs. Although I don’t think ginger is good for doggies, so I only give Juniper the carrot tops. You can easily make these in bulk and snack on them all day. If you try cooking these Honey Glazed Carrots with Ginger, please leave me a comment and let me know! I always love to hear your thoughts. DON’T FORGET TO PIN AND SHARE THESE HONEY GLAZED CARROTS TO MAKE FOR AN EASY AND FLAVORFUL DINNER OR HOLIDAY SIDE DISH THE WHOLE FAMILY WILL LOVE. Honey Glazed Carrots with Ginger is a deliciously sweet and savory side dish loved by the whole family. 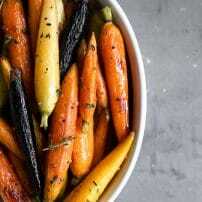 Enjoy these Honey Glazed Carrots with your favorite chicken, beef, and fish recipes, or add them to your next holiday menu. Fast, easy, and incredibly addictive, you'll love the sweet and simple flavors of these delicious glazed carrots with ginger. Prepare the carrots. 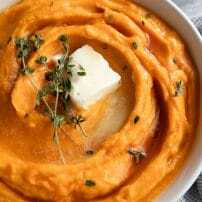 I purchased prepared petit carrots from Trader Joe's, however, you can easily prepare this recipe with any carrots. Simply wash and peel your carrots. Dry well. if your carrots are thick, I suggest slicing your carrots in half vertically so that they are all approximately equal width. Transfer the prepared carrots to a large mixing bowl. Prepare the glaze. In a small bowl whisk together the olive oil, honey, ginger, salt, pepper, and fresh rosemary. Coat the carrots in the glaze. Add the glaze to the mixing bowl with the carrots. Mix well to completely coat the carrots with the ginger honey glaze. 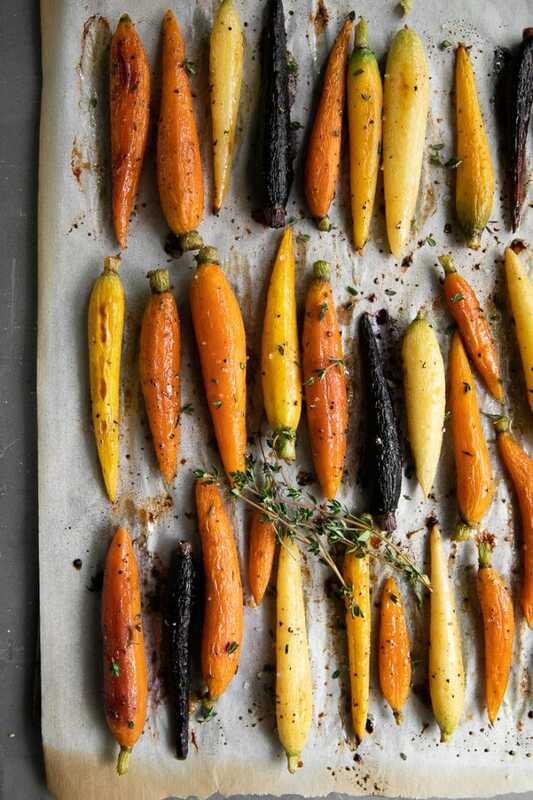 Spread the carrots evenly across the prepared baking sheet and sprinkle with fresh thyme. Bake and serve. 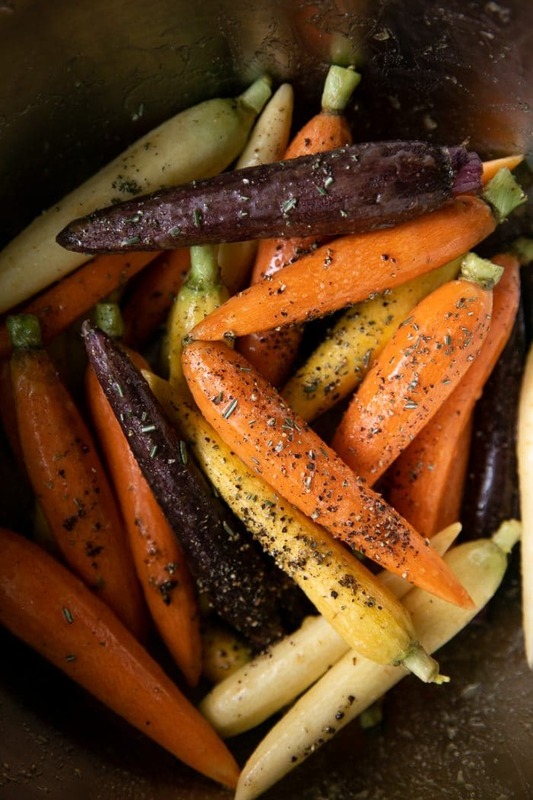 Bake the carrots for approximately 20-25 minutes, or until fully cooked and fork tender. Remove from the oven and drizzle with additional honey and sprinkle with fresh thyme, if desired. Enjoy! If you're short on time and don't feel like grating your own ginger, I highly recommend Dorot Gardens. 2 cubes equals 2 tsp of fresh ginger.